Director-General Osamu Motojima (centre, in blue) leads a delegation that includes Ken Blackler and Mitsunori Kondoh from the ITER Organization, Joo-Shik Bak from ITER Korea, and Ned Sauthoff from US ITER. 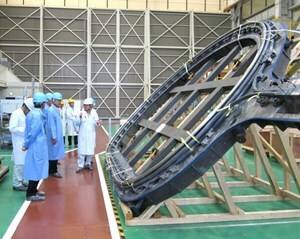 Pictured, a mockup of a section of toroidal field coil case (Toshiba, Keihin Product Operations, Yokohama, Japan). In order to confirm the current state of Japanese industry in the aftermath of the earthquake and tsunami that hit the island on 11 March, this month I led a delegation to Japan that included representatives from the ITER Organization and the Korean and American Domestic Agencies. We visited several industrial companies involved with the manufacturing of ITER's toroidal field magnets and superconducting strands for the central solenoid—components which are currently the most critical for adhering to ITER's construction schedule. The companies visited reported that the impact of the earthquake on their production capacity was minimal: none had suffered major damage and the problems encountered had been fortunately very short lived. Although the supply of materials was briefly affected after the earthquake, the problem has now been mitigated and all factories are working normally. It is with great respect that we witnessed the strong will and motivation of Japanese industry to recover its manufacturing capabilities; this will certainly help the country to recover from the impact caused by the earthquake, tsunami and finally the nuclear accident. Although on average the electricity supply is also running normally again, it was reported that there were government limitations on peak loads. Our industrial contacts explained that this problem has been effectively mitigated through the rescheduling of some heavy operations, for example over weekend hours. 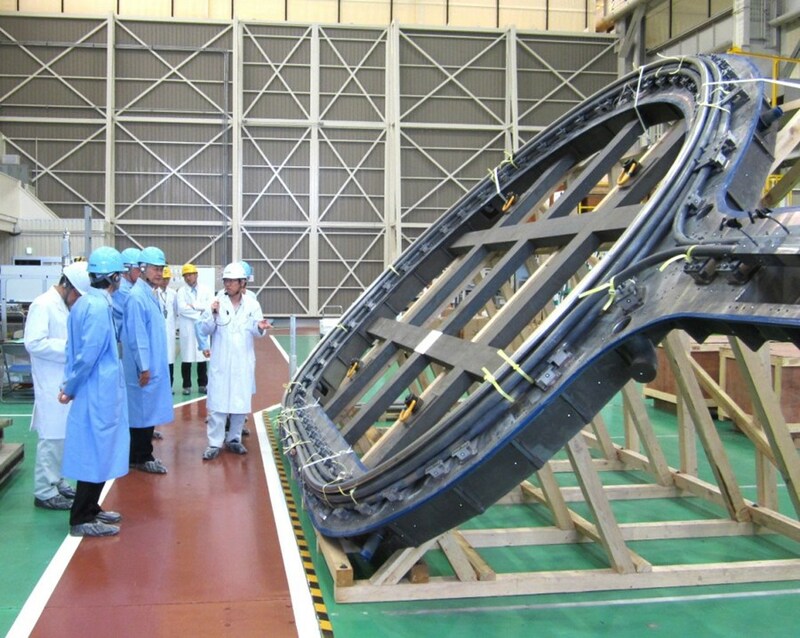 The delegation was able to confirm that production of the JT60-SA vacuum vessel is progressing well and has not been affected by any material shortage or power limitations. Japanese industry is currently providing massive engineering support to recover the Fukushima Daiichi nuclear reactors. It was confirmed, however, that support in this area is not the same as that needed for fusion: therefore this will have no impact on ITER work. Japanese industry declared its strong commitment to supporting ITER and to doing everything possible to deliver on time as soon as the contracts were signed. Based on what we saw and what was discussed with senior engineers and members of the companies' top-level management, we concluded that the efforts of industry to recover from the earthquake damage were successful—a fact that is highly commendable only four months after the earthquake. There is no evidence that we will have to face critical delays caused as a direct impact of the disaster. However there are other issues which may affect the schedule—in particular the significant financial impact of the earthquake on the Japanese government. A huge amount of financial investment will be required to replace infrastructure in the damaged locations, and also to recover from, and compensate for, the nuclear incident. The Naka site also needs repairs. Efforts will be required by the other six ITER Members in order to reduce the financial burden on Japan for several years in order to support the creation of a realistic and acceptable project schedule. The countermeasures to mitigate the impact on the ITER Project are currently under intense investigation by a Special Task Group that reports to the Management Advisory Committee and the High-Level ITER Organization-Domestic Agency Coordinating Meeting.